Marty Balin (/ˈbælɪn/; born Martyn Jerel Buchwald; January 30, 1942 – September 27, 2018) was an American singer-songwriter, and musician. He was born in Cincinnati, Ohio. Balin was best known as the founder and one of the lead singers and songwriters of Jefferson Airplane and Jefferson Starship. Balin died on September 27, 2018 in Tampa, Florida at the age of 76. ↑ Pareles, Jon. 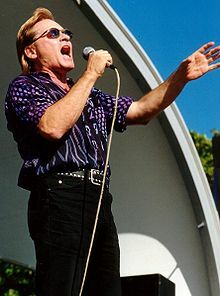 "Marty Balin, a Founder of Jefferson Airplane, Dies at 76". NYTimes.com. New York Times. Retrieved 29 September 2018. This page was last changed on 2 October 2018, at 01:31.